Be honest: Do you treat visits to your dentist with the same importance you give to keeping appointments with your regular physician? For many of us, the answer is “no.” This is unfortunate, because your dental health is tied in with your overall well-being in many crucial ways. Taking care of one helps you to take better care of the other. Let’s see why this is true. Because tooth decay never rests. As you read these words, harmful bacteria is at work in your mouth, eroding the enamel that protects your teeth. Waiting until you have a toothache is too late to prevent serious damage, the kind that can cost you more than money. Because brushing and flossing by themselves aren’t enough. Don’t get us wrong. It’s important that you brush at least twice a day and floss at least once a day. More often is better. But even the best toothpaste and toothbrush cannot remove all of the plaque that builds up on your teeth in just a few days. Left unremoved, plaque can spread from your teeth to your gums and even into your jaw. You need regular professional cleanings. Because serious oral health problems can disguise themselves as common conditions. For example, often the initial warning side of mouth or tongue cancer is a simple sore or unusual taste in your mouth. Only a qualified dentist can diagnose the true cause of everyday symptoms. By assuming the problem isn’t serious, you delay treatments that could save your life down the road. Because dental medicine is always advancing. Products and techniques that are state-of-the-art today are often obsolete tomorrow. Sticking with the same old approach to tooth care may rob you of important advantages you could otherwise be enjoying. Why put yourself at a disadvantage? Because you can never know enough. There’s a reason why dental professionals are always going back to school to improve their skills. The knowledge they gain from continuous training makes them a treasure trove of information for their patients. Because it sets a good example for your loved ones. Seeing you take care of your teeth and gums encourages those you care about to do the same. This is important whether you’re a single person or a parent with young kids. Going it alone is no way to ensure continued good health, either for you or for others. With all the countless tasks that occupy the average person’s busy day, it’s easy to let important matters slip your mind. All of us do it. This is why it’s so crucial for you to call your dentist today to schedule your next appointment. The small amount of time and effort this takes will more than pay for itself, not only with brighter, healthier smiles but a better life overall. That’s a good deal for all involved. 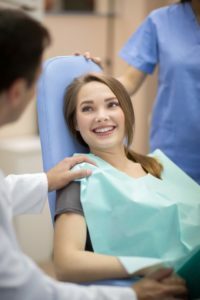 The doctors at Flenniken Family Dentistry have the skills and specialized tools needed to treat all sorts of oral health issues, from filling cavities to performing extensive cosmetic and restorative surgery. You can contact their office online or by calling (717) 249-7777.